Drug companies responsible for swine flu outbreak? With 16 deaths from swine flu confirmed worldwide, there's a growing stir surrounding the H1N1 virus. American airport officials diverted a flight from Germany to Washington DC because a 53-year-old female passenger complained she might have symptoms of the deadly disease. 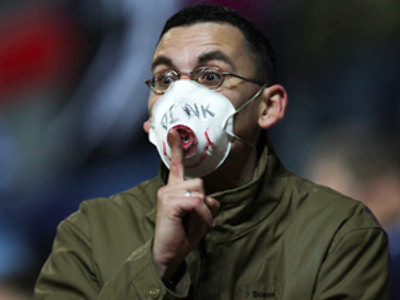 Mexico has asked Chile to host two football club matches because of the swine flu outbreak. Greece – which has no confirmed cases – has indefinitely frozen exports of antiviral drugs to safeguard the country. Across the world more than eleven countries have confirmed cases of the infection, Denmark and Hong Kong being the latest. Mexico is preparing to shut down parts of its economy for five days to slow the spread of swine flu. So far 12 deaths in the country have been officially attributed to the virus. The number of cases of swine flu at the heart of the worldwide outbreak has risen to over 340, says Mexico's health secretary. The World Health Organization has started referring to the virus as ‘influenza A’ following concerns from farmers that the term 'Swine Flu' may be misleading. The disease cannot be caused by eating pork, the organization says. One person has died in Texas, which is the only death outside Mexico so far. A state of Public Health emergency has been declared in the US. Across the world at least thirteen countries including Israel and Spain have confirmed cases of the infection. A 'pilot vaccine' is being developed under the supervision of the EU. However, some conspiracy theories that are spreading just as fast as the virus have already dismissed the hysteria over the virus as a malevolent plot orchestrated by pharmaceutical companies in order to cash in on people’s fear. One in particular believes that the strain has been purposely engineered so companies producing vaccines can cash in. “That’s the whole medical industry. I don’t get the flu shot, ‘cause it seems whenever I get the flu shot I get sick. If I don’t get the flu shot, I don’t get the flu. Are there swine in New York City? Sure – the politicians,” says a New York resident. According to Alex Jones’s web site www.infowars.net , US pharmaceutical company Baxter is working on a potential vaccine. Back in December, Baxter reportedly distributed vaccines to 18 countries contaminated with the deadly avian flu virus. The discovery came after the vaccine tested on ferrets in the Czech Republic killed the animals. New Yorkers suggest Baxter’s current actions could be masking a shady deal. They think that because the competition on the market is so great, some people will find any way to make a quick buck. Face masks, for example, are completely sold out at all drug stores in New York City, but RT walked the streets of Manhattan for hours and did not see one person wearing these so-called ‘pandemic protectors’. Instead, amid the swine flu outbreak, people are socializing and lunching in parks. The Big Apple may have the most cases of the H1N1 strain in the US, but New Yorkers say the media is more panicked than the people. Hamilton Nolan from gossip website Gawker compares the current frenzy with 1976, when the US experienced its first swine flu panic and President Ford made inoculations mandatory. “The cure ended up being worse than the actual pandemic. It was the same thing. Swine flu appeared, people got scared. They demanded action by the government. The US government spent $135 million on vaccines and people ended up getting sick by the vaccines,” Nolan says. Dozens who were vaccinated fell ill and were later paralyzed or died. Presently only one US swine flu death has occurred. “I wouldn’t go anywhere in confined places now. It’s not that going into Mexico. It’s that you are in a confined aircraft where someone sneezes and it goes all the way through the aircraft. That's just me. I would not be at this point, if they had another means of transportation, suggesting they ride the subway,” said Joe Biden. The economy is sinking. Chrysler just declared bankruptcy and the US Vice President went on national television urging Americans to avoid confined public spaces like the subway system. So imagine if millions were to actually listen to his suggestion and seek out other forms of transportation. Some may ask – could this possibly give just a little boost to the countries dying auto industry? At the very least, the general consensus from everyone is: stay home if sick, wash hands often and cover those coughs and sneezes. "Swine flu is manmade virus?"